Xbox Game Pass has added several games players can get for free if they are subscribed to the service. Xbox Game Pass is a $10 per month subscription (which is separate from the Xbox Live Gold subscription) where players can a bunch of game free if they pay only for the subscription. Games are added every month, some being older titles and some being newer. 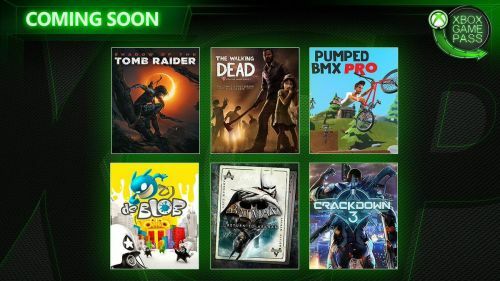 For February 2019, Xbox Game Pass has added the following games: Shadow of the Tomb Raider, The Walking Dead: Complete First Season, Pumped BMX Pro, De Blob, Crackdown 3 and the first two Batman Arkham games (Arkham Asylum and Arkham City). Shadow of the Tomb Raider, which is the third instalment in the rebooted Lara Croft series, will be available on Game Pass on 7 February. Side scroller BMX trick game Pumped BMX Bro and the entire first season of Telltale's The Walking Dead will release on the same day. The following week, on 14 February, De Blob will be added. De Blob is a puzzle adventure game where you get to paint an entire city and accumulate points. It doesn't sound very fun when you hear it, but it is surprisingly good. Originally released on the Wii, De Blob got an Xbox One port about 9 years later. On February 15, Crackdown 3 will be released for Xbox One (and PC). This is the only game on the list which is a new release. You can get this open-world action adventure game for free if you are on the Xbox Game Pass. And finally on February 21, the remastered versions of Batman: Arkham Asylum and Batman: Arkham Knight will be added. These are some of the best games ever made and features the return of the voice actors from the Batman: Animated series. You can checkout the Xbox Game Pass page for a full list of games available.